Join us for a Taster's Mystery Quilt Tour. Visit each of the 4 participating Quilt shops to receive: The parts of the Free Mystery Quilt Pattern Coordinating Fat Quarters to use in creating the project Yummy Recipes Treats Fun! We are starting a new tradition with a Spring Sip and Shop! Pull out your favorite fascinator and join Off the Rails Quilting & Reclaimed Rails Brewing Company for a morning of accessorizing! 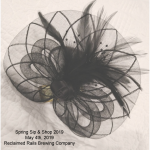 The Spring Sip and Shop will be held May 4th at Reclaimed Rails Brewing Company. Ann has her fascinator and derby dress ready to take her spot on her ladder at 9:30am. Reclaimed will open at 8:45am. Register now to reserve your spot. Each registered attendee will get at $10 Gift Certificate for Off the Rails Quilting at the event.